Exploring and swimming in cenotes (natural sink holes) is an amazing experience. The cenotes or sink holes are located near a small hamlet, half a mile from Cuzama (and about 1 hour and 15 minutes from Merida). They are located in what used to be a hemp (or sisal) plantation. The (narrow gauge) railroad tracks and the wagons you will ride on were the infrastructure that allowed to transport the hemp to the production facility at the hacienda. These wagons have been modified for passenger use; 4 visitors fit in one cart, (maybe 5/6 if small children are in your party). Each wagon is hauled by a horse across the abandoned estate. After the adventure, continue to Mayapan, the last Mayan capital of the northern lowlands. Mayapan is a small-scale version of Chichen Itza, and became the capital of the northern lowlands after the downfall of Chichen Itza. This site is off the beaten path, and thus less crowded. 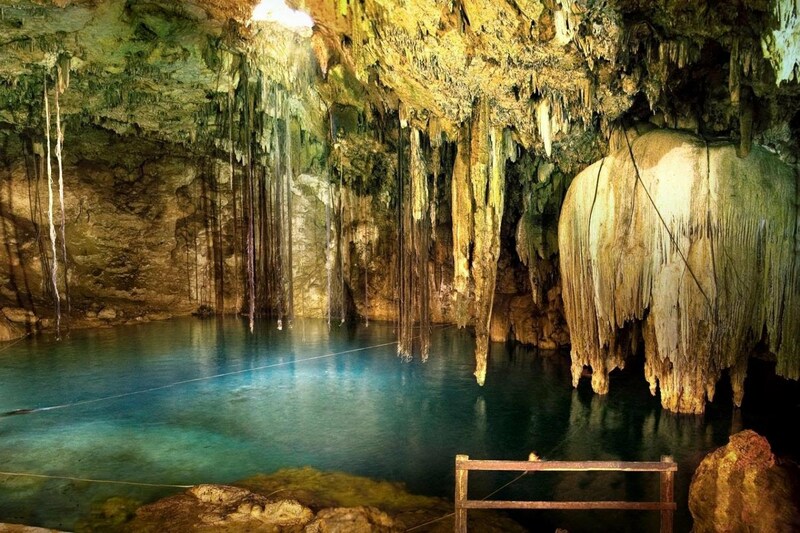 If you wish to explore more cenotes, instead of going to Mayapan, have lunch at Cuzama and then you wil be driven to the 2 cenotes within the village of Homun, only 15 minutes away from Cuzamá. Our driving service rate includes, van & driver, insurance, fuel, toll fees, cold bottled water (ice boxes on board the vehicle), as well as towels for swimming activities. Rates consider Merida as collection and drop-off destination. The 10-hour continuous driving service allows to complete any published day trip without rushing through the experience. Should you need additional time, add $150 MX pesos per hour (or $10 USD dollars). Please add 16% Mexican sales tax. Meals & admission fees to sites are not included.